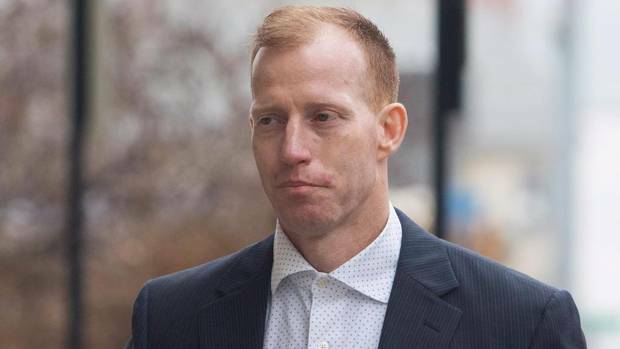 Alberta Who is Travis Vader, the man at the centre of one of Alberta’s highest-profile homicides? Travis Vader arrives at court in Edmonton on March 8, 2016. 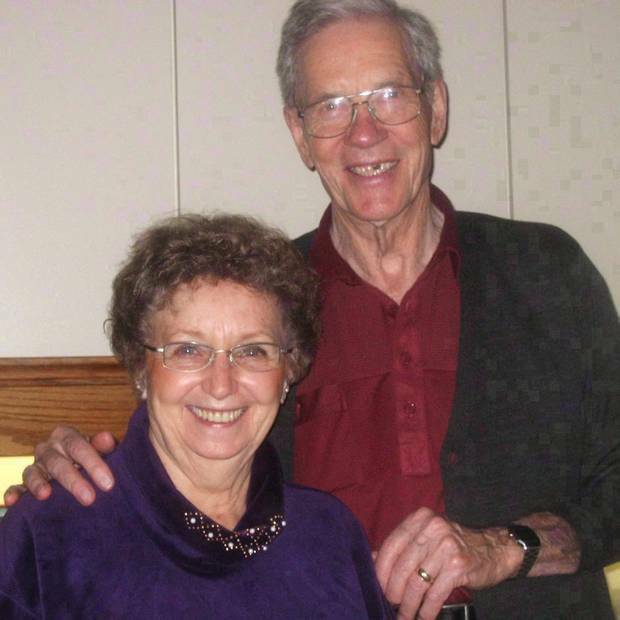 In an Edmonton courtroom on a frigid Monday morning, members of a grieving family attempted to express the many ways their lives have been torn apart by the killings of Lyle and Marie McCann. There were the familiar scars that homicide leaves on survivors: Deep anxiety, nightmares, a fear of ringing phones and of people not answering. There were the unanswerable questions: How could someone do this? Why? And, in this case, there was the question that has hung over the province for nearly 6½ years, since the McCanns headed out on a road trip to British Columbia one July morning and met deadly violence along a highway in western Alberta. Reading aloud from his victim impact statement, the couple's son, Bret McCann, put that question directly to the man convicted of killing them. "Travis Vader, where are the bodies of my parents?" he asked. Mr. Vader did not answer. In the years since 2010, when the McCanns disappeared, Mr. Vader has become one of the province's most recognizable figures: A man with a villain's last name and a widely disseminated mugshot, charged – and now convicted – in the killings of a kindly couple in their late 70s, one of the biggest RCMP cases in Alberta's history. And while he did not testify during his trial, and said nothing in response to Bret McCann's plea, Mr. Vader has been far from quiet in the past 6½ years, speaking often to media both on and off the record about his grievances with the justice system, and testifying at length this week to a litany of mistreatment he says he suffered at the hands of RCMP, justice officials, correctional officers and inmates. The allegations range from a broken wrist and feces "bombs" in his cell to food he found inadequate or substandard. 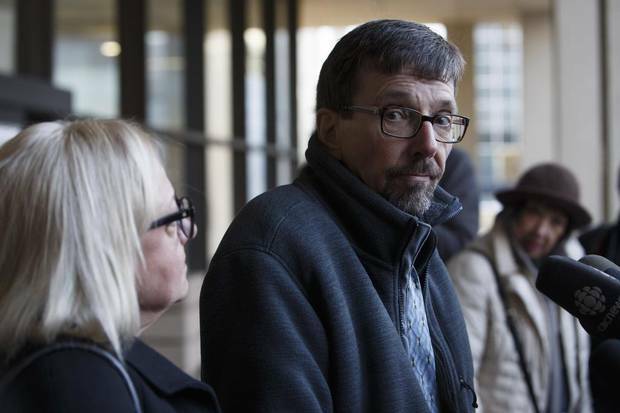 Bret McCann, flanked by his wife, Mary-Ann McCann, left, speaks to the media after giving a victim-impact statement during Travis Vader’s sentencing hearing. A notice of motion filed by the defence says the prosecution should be stayed on the grounds that Mr. Vader was subject to an unlawful strip search after his arrest, that RCMP "deliberately and actively prevented" him from speaking with a lawyer, and that he faced "cruel and unusual conditions" in pretrial custody, in violation of his rights under the Charter. If the charges are not stayed, the defence contends, the alleged violations should at least be a factor in sentencing. Mr. Vader has also filed a million-dollar lawsuit related to the investigation, prosecution and his time in custody. The Crown spent much of the week-long sentencing hearing attempting to disprove Mr. Vader's allegations, including by playing several hours of RCMP recordings in which officers can be heard making repeated attempts to contact the lawyer Mr. Vader requested, even when Mr. Vader had the incorrect name and did not know the phone number. The Crown also questioned Mr. Vader's versions of various events, cited institutional charges Mr. Vader faced for assault on another inmate and behaviour toward a guard, and pointed to comforts and medical treatments he did receive in custody, including an additional mattress and cream for his sensitive skin. "He's probably delusional enough to consider himself a victim here," Bret McCann said, standing outside court after listening to Mr. Vader testify on Tuesday. "I personally don't think he is a victim, and I think he's playing it up for what it's worth here." Mr. Vader was born in Alberta in early January, 1972. He spent much of his childhood with his father, stepmother and sisters in Texas, but the family moved back to the Niton Junction area west of Edmonton when Mr. Vader was in his teens. More than six feet tall, with red hair and hazel eyes, Mr. Vader was known in the area to have both a seductive charm and an intimidating temper. Edward Vader once described his son as "a fairly normal kid who got into a few fairly normal boy problems," such as fighting and drinking. After high school, the younger Mr. Vader started working in the oil patch and married a woman with whom he had six daughters, in addition to becoming stepfather to her son. In recent years, Mr. Vader has talked often about his success in that period, describing his accomplishments working in the oil field and painting himself as an active and loving father who did what he could for his children. But the picture, even then, was far from perfect. The family's house near Niton Junction burned down shortly after Mr. Vader's wife moved out in November, 2004, taking the seven children, all under the age of 13. Victoria Vader told the Edmonton Journal at the time that she had returned to the house to get some clothes, and found it in flames. "I'm looking at this as a sign that now, my marriage is over," she said then. "This is a new beginning for us. This has been a bad year, but hopefully, we'll have a better year next year and in the years down the road." Her teenaged son later told reporters the family always suspected Mr. Vader set the fire, but no charges were ever laid. Despite those suspicions, the couple reconciled for a period and bought a house in British Columbia, but Mr. Vader left in 2008 and later returned to Alberta. By the summer of 2010, Mr. Vader was known to residents around Niton Junction as a methamphetamine user who was tough and "somewhat feared," and was suspected in a string of thefts and property crimes. 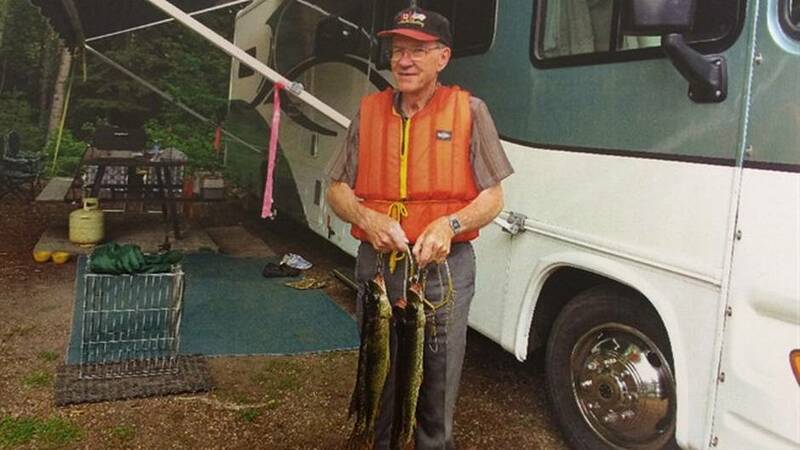 When the McCanns' motorhome was found burning in the Minnow Lake campground, Mr. Vader was already wanted by police on outstanding warrants, including for arson, and drug and firearm offences. Mr. Vader's father, Edward Vader, and his wife had been telling those in the area to turn Travis in to police if they saw him, or to call the Vaders so they could. When the RCMP named Travis Vader as a person of interest in the McCann investigation and released his mugshot to the public, Edward Vader warned people in the community "not to corner him out here." "I've wanted him arrested for a long time and that's it," the elder Mr. Vader said then. "He and I don't talk." 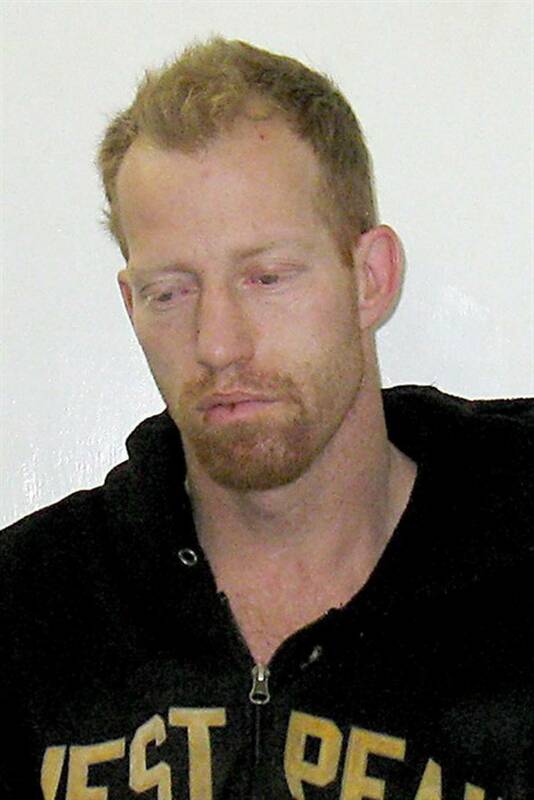 Travis Vader was arrested in a field outside a friend's house in the area on July 19, 2010, two weeks after the McCann's motorhome was found in flames. Six weeks later, the RCMP upgraded Mr. Vader from a "person of interest" in the McCanns' disappearance to a suspect. He was charged with two counts of first-degree murder in 2012 and convicted of two counts of manslaughter this fall, after a dramatic legal saga that included a stay and recommencement of the charges, a lengthy trial and a serious error in the judge's original, televised verdict. In and out of custody as his case wound through the courts, Mr. Vader also incurred new charges, including for breaches of court-ordered conditions, obstruction of justice, theft and domestic assault. He got engaged to two different women, and fathered a baby girl. Out on bail during his murder trial, he repeatedly came to court late and gave a variety of excuses before eventually being returned to custody after allegedly testing positive for methamphetamine use and contacting a Crown witness. RCMP also laid new charges of theft of copper wire and possession of a stolen truck, and he has been in custody ever since. Although the McCanns' bodies have never been found and the circumstances of their deaths are not known, Court of Queen's Bench Justice Denny Thomas concluded Mr. Vader killed them in the course of a robbery. The sentence could range from a life in prison to a brief term in custody, or even time served. Sparring with prosecutor Ashley Finlayson from the witness box, Mr. Vader at times smirked and rolled his eyes and became noticeably impatient with Mr. Finlayson's questions, sometimes correcting the prosecutor on points from the documents and record. As he spoke, Mr. Vader often cradled his right hand, which was heavily bandaged. Under questioning by the Crown, Mr. Vader said he broke his hand after punching the wall of his cell. Bret McCann, who has become the face of his family's quest for justice, spent much of the week with his eyes fixed steadily on Mr. Vader, a gaze he said on Tuesday was intended to send the message: "Be a man. Admit that you did this. Tell me where my parents' bodies are." Instead, when their eyes met, Mr. McCann says, Mr. Vader made a gesture he interpreted as "why are you picking on me," then mouthed only one word. "Wow."